Almost 7 years ago I wrote a series of posts about how to photograph geisha and maiko on the streets of Kyoto, especially in Gion Kobu, the largest and most famous geisha district (and the one most tourists visit). I wrote the series because I know some geiko (as geisha are called in Kyoto) and maiko personally, and it saddened me to see the way they were often treated on the streets of Gion, even before the tourist boom that has steadily been increasing ever since. I also wrote the posts because I knew that most of the tourists and photographers who visited Gion Kobu were unaware of how their behavior was affecting the geiko and maiko. I was aware because I had made some of the same mistakes they were making when I first started photographing geiko and maiko back in 2002, and I had learned a lot in the intervening ten years from geiko and maiko themselves, the owners of the tea houses where they work, and the owners of the houses where they lived. I wanted to pay back some of the many kindnesses all these women (and some men) had given me, and one way I thought I could do this was to try to make tourists and photographers more mindful of their behavior while in one of Kyoto’s five geisha districts. One of the posts I wrote was How to Photograph Geisha: Unwritten Rules. If you click anywhere on the title of the post, you can read it in full. “Fortunately, I learned about never showing a photograph of a geiko or maiko with her leg exposed beneath her kimono in a much better way. I was visiting all the okiya in Gion Kobu and Miyagawa-cho to get permission to include photos in my first book, One Hundred Views of Maiko and Geiko. There was one photograph I was particularly curious about. I loved it, but I thought there might be a problem. Two geiko were walking towards me down Aoyagi-koji after Miyako Odori, and they were engaged in an animated discussion. In the photograph, I had captured them both laughing. The only problem was that a centimeter or two of one of the geiko's legs was visible beneath her naga-juban (under kimono). They were walking so fast that her juban had flipped up, revealing a small bit of skin. I just had a feeling that the geiko wouldn't like that and wouldn't let me use the photo. I was right. My assistant and I went into the okiya and talked to a very friendly older woman who worked there. We showed her the photo, and she started laughing. She said I had really captured the geiko's personality in the photo. Then the woman noticed the kimono, and her expression changed. She explained that geiko were supposed to wear their kimonos perfectly at all times, and that meant that you should never see a geiko's legs. They should be covered by the naga-juban. Then the woman said with a laugh, "Of course, in real life, no one is that perfect, but still..."
There are a few things I’d like to point out about my story, which happened in 2006. This was a very pleasant exchange. As I wrote, the woman was laughing. We were talking about a faux pas, not a major blunder or very serious offense. 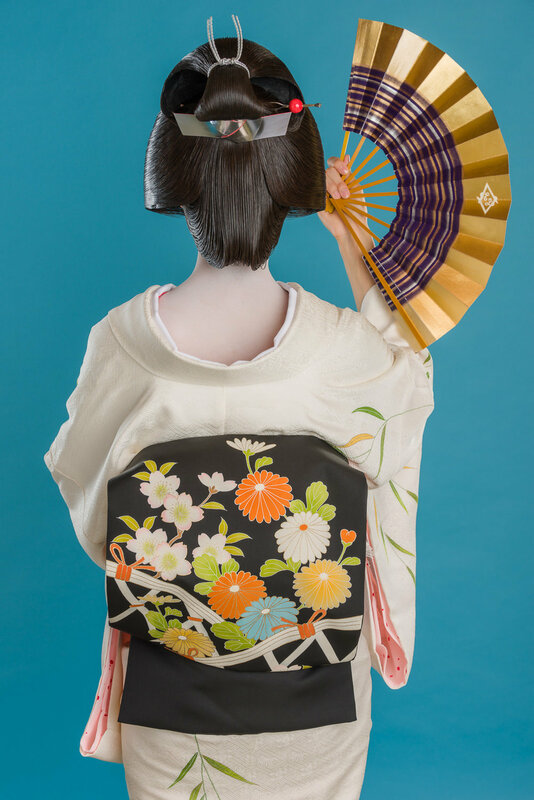 One of the reasons the geiko would have been embarrassed was because I was asking for permission to include the photo in my book, a book that others in the geisha districts were potentially going to see. Also, books tend to be around for a long time since they are printed. Since most of my photography since 2007 has been done inside tea houses, this issue rarely comes up for me. When it does, I usually delete the photo on the spot. If the photo is really good otherwise (which has happened to me only once), I will try to fix the problem. And believe it or not, in the one photo I did correct, the problem was with an otokoshi, not a maiko or geiko! I think the important thing to keep in mind is that if someone posts a photo on social media or their website with a bit of a geiko or maiko’s leg showing, they probably did it not knowing that they might cause a geiko or maiko some embarrassment if the woman actually saw the photo, which is highly unlikely to ever happen. It is important to respect geiko and maiko, but it is also important to respect other people as well, even people who make unintentional mistakes. And with as much hostility and anger as there is in the world right now, I think it is more important that we approach others with kindness and openness, not condemnation and criticism.